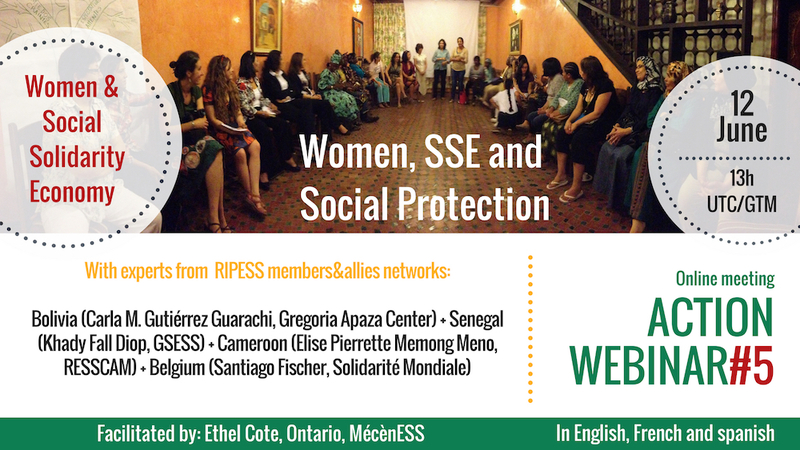 For the 5th session of our Women & ESS seminar cycle, we will discuss the issue of Women, SSE and Social Protection with four activists in the field, coming from Bolivia, Cameroon, Senegal and Belgium. This session will be hold on June 12th at 13H UTC / GMT. Please register by sending us an email to: info@ripess.org. We will then tell you how to join the webinar. We will have the pleasure to welcome four people during this session, which will be moderated by Ethel Cote, Women Entrepreneurs Network-Women of the World, Canada. In charge of political advocacy on the themes of decent work and right to social protection at WSM-Solidarité Mondiale, Santiago Fischer has been active in development cooperation in Belgium for more than 10 years, putting social justice at the heart of his action, based on his experiences on the ground in Latin America and Africa with various associative partners. During the webinar, Santiago will share with participants the WSM-Global Solidarity experience on the three continents where the organization is active (Africa, Asia, Latin America). Its 84 partners from trade unions, youth movements, women’s movements and the social and solidarity economy are putting in place innovative strategies to transform societies in depth, in relation with gender equality and access to social protection for the beneficiary populations. Created after the third international meeting on the globalization of solidarity in Dakar in 2005, the GSESS is working to strengthen the SSE actors in Senegal, in particular by highlighting the best practices and bringing together the civil society with socially responsible enterprises, political organizations, trade unions and universities. The GSESS is member of RAESS, the Solidarity Economy African Network, itself member of RIPESS. Expert economist in local development, international cooperation and consulting with small individual and associative organizations. Currently coordinator of the Economic Empowerment Program of the “Centro de Promoción de la Mujer Gregoria Apaza“, which promotes equality and equity between men and women, and works on the establishment of a business incubation model with a social and solidarity approach. The Gregoria Apaza center collaborates with the SSE Bolivian network , itself attached to RIPESS LAC, the RIPESS network in Latin America and Caribbean.